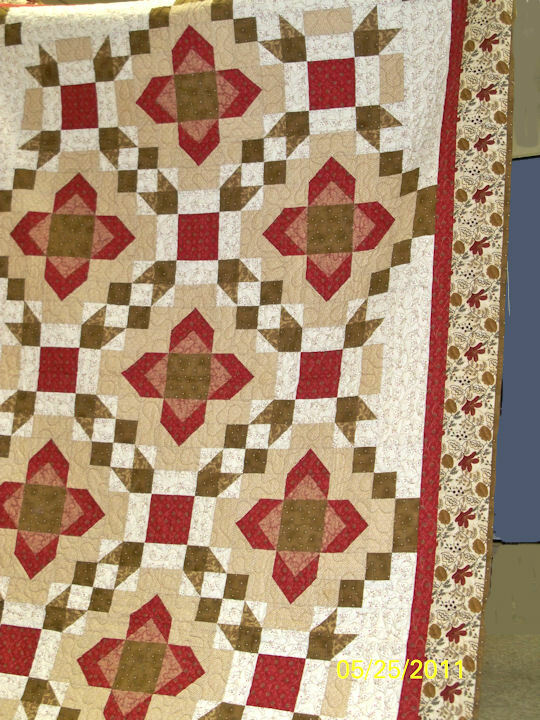 The following quilts show different colorways. 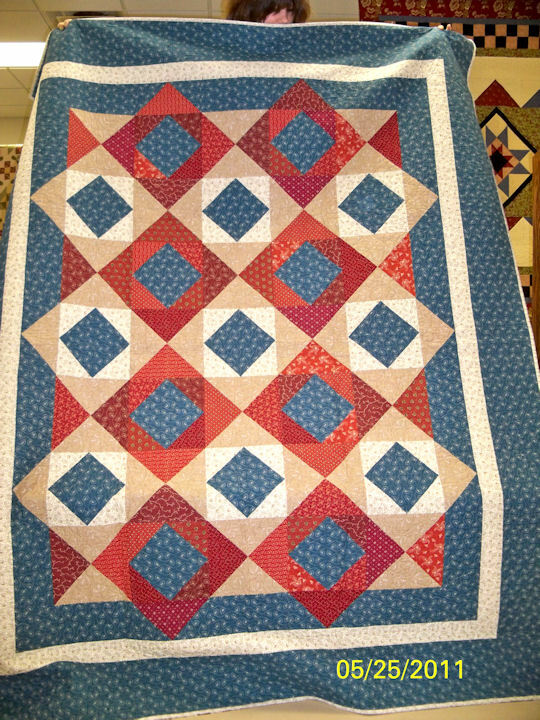 The placement of color can change to look of the quilt. 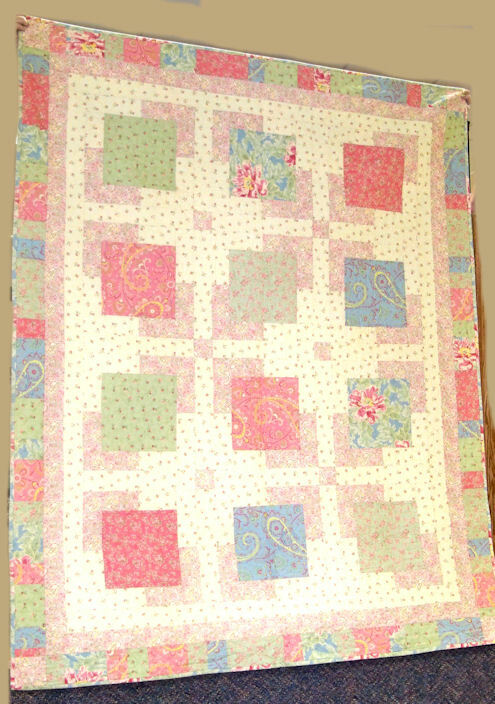 All quilts were made my Amy Davidson and her patterns can be purchased on her web site. 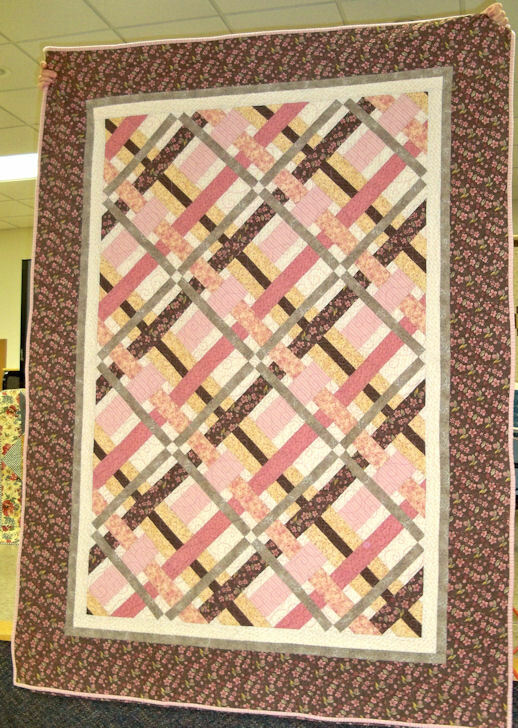 Here are pictures of quilts done by Amy Davison, most of them were samples made during her quilt workshop classes. 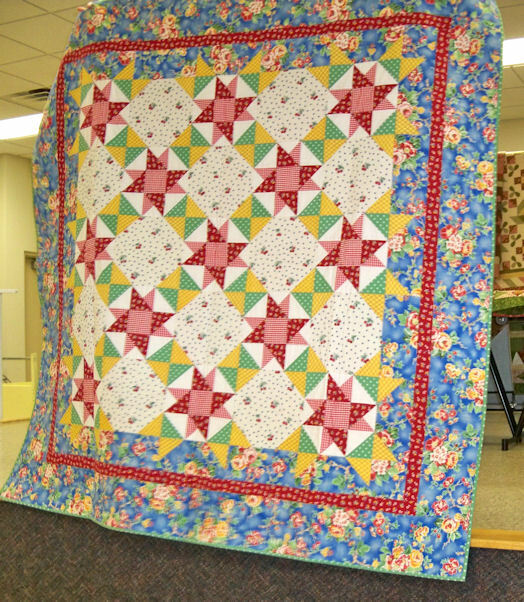 Many of the quilts date back to the late 1990s. Amy loves traditional fabrics with traditional patterns. 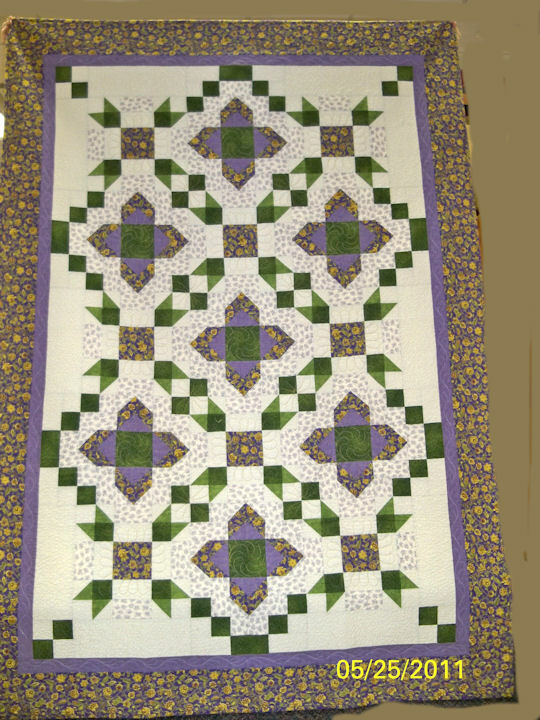 She does not use the typical blocks shown repeatly in quilt magazines. 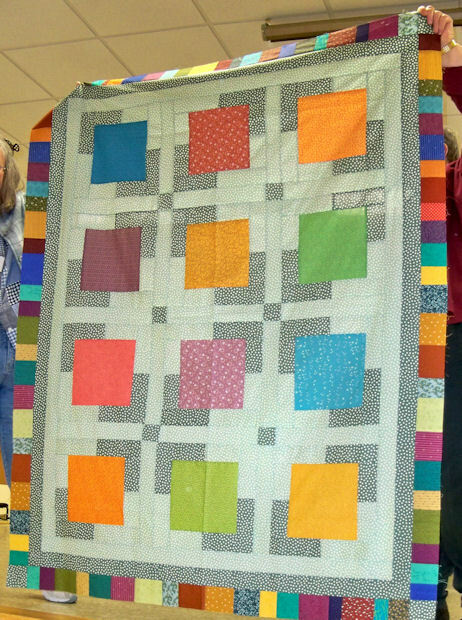 She is adventuresome in her quilt making and designs many quilt patterns that use older blocks. I will be posting more pictures in the future. Hip to be Square and Hip to be Square, Baby … are Amy’s best selling patterns. 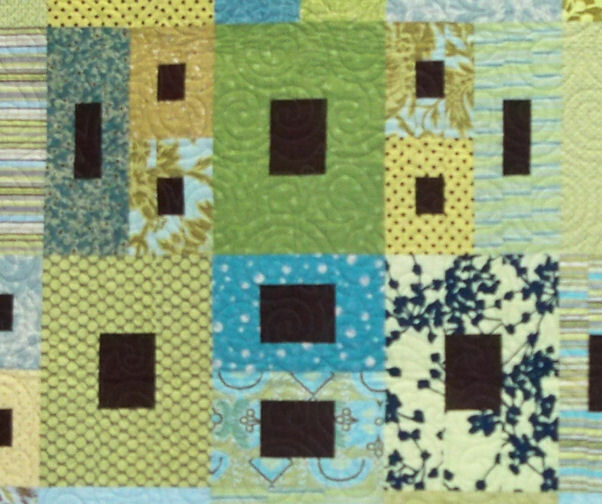 The astute placement of color changes the way the quilt blocks look. My quilt, FABRIC TALKS TO ME, uses the HIP TO BE SQUARE sashings for my quilt. 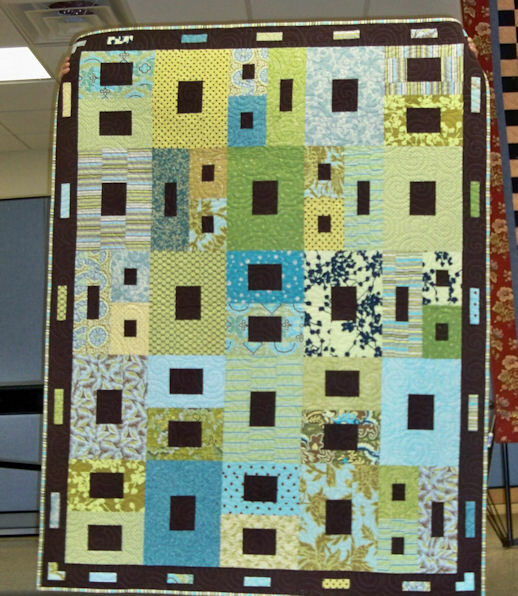 The quilts below are made using different colorways. Amy had a complete slide show of quilt pictures that compared and explained the colorways. 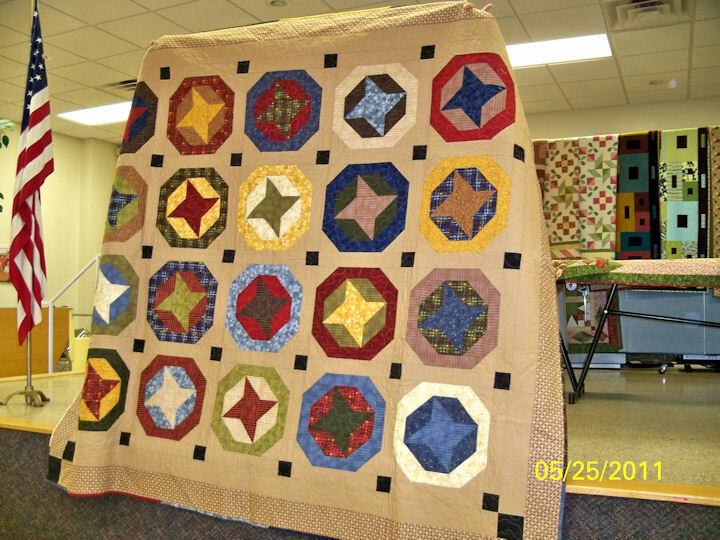 This quilt was made by Ginny a guild member. 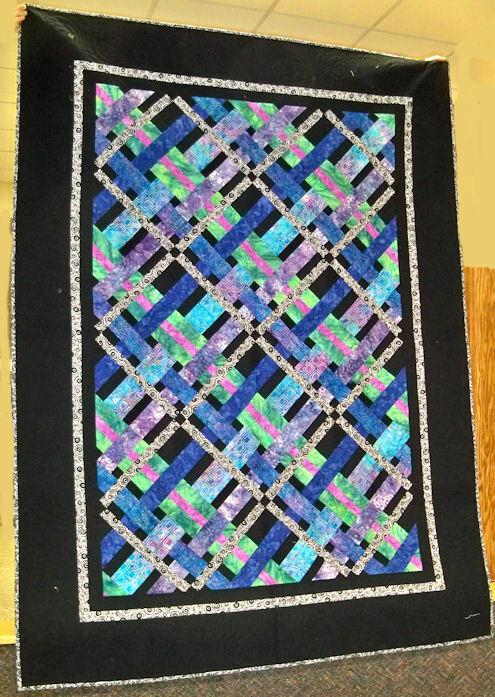 Mad about Plaid is a pattern created by Amy Davidson and is available on her web page. Humble Bee Quilt Works…. Amy Davidson Studio. Amy said she is a County Girl and loves the rural, traditional pallet of colors. 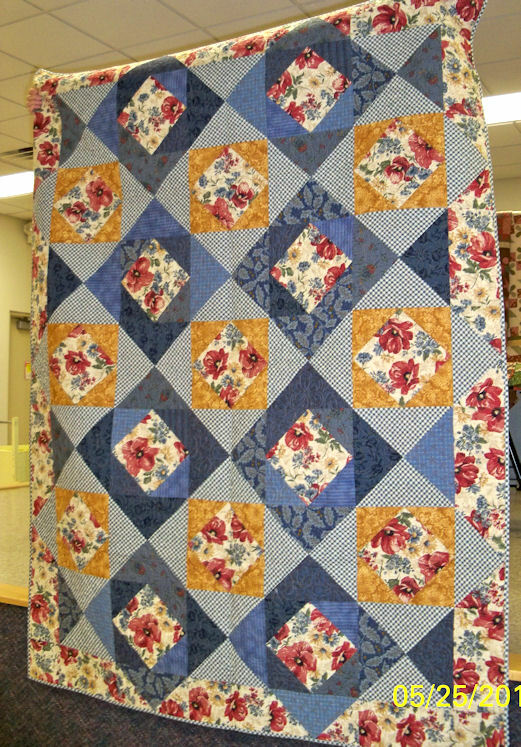 A quilt being like a hug, making you feel warm and comfortable. 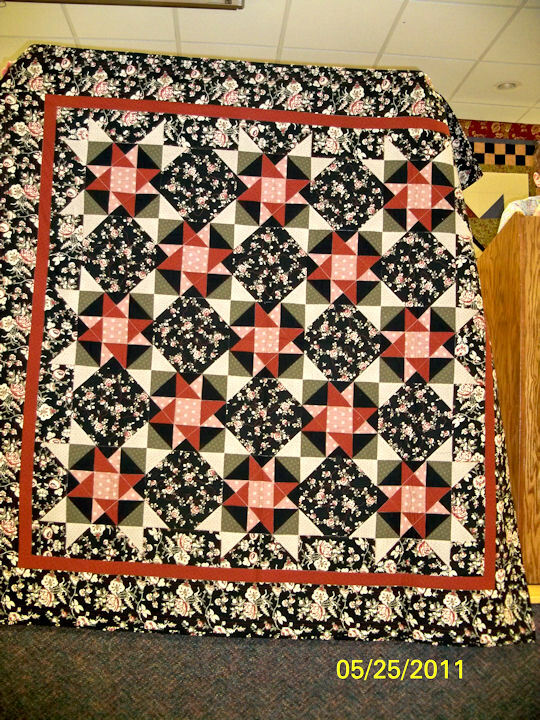 This quilt was made by Ginny one of our prolific guild members. 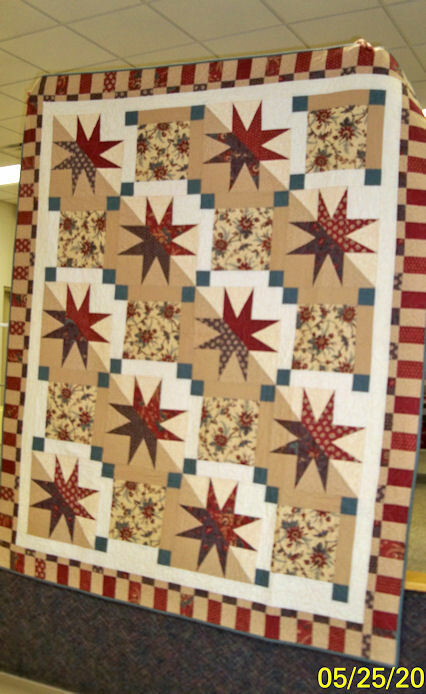 Last night, I attended a lecture by Amy Davidson, at the Evening Star Quilt Guild. Amy is a talented quilt designer from here in southeast MI. 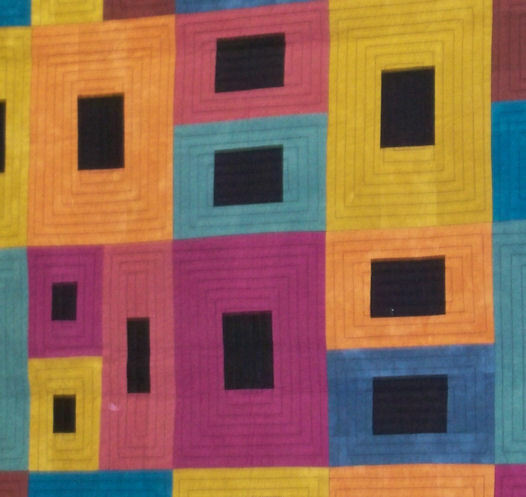 The subject….. COLOR for QUILTERS. 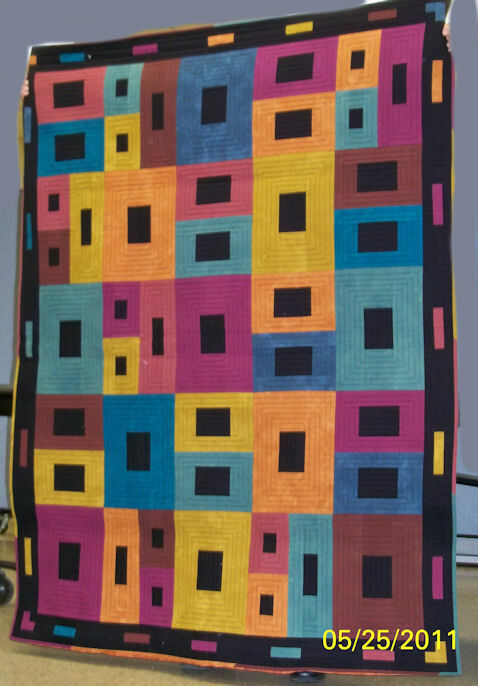 I must say it was one of the better quilt based color lectures I have attended. I enjoyed it and I learned a lot. I will be posting pictures from the lecture and a podcast in the future. Amy’s lecture, COLOR FOR QUILTERS, she hopes to take THE FEAR OUT OF CHOOSING, BUYING AND USING OUR FABRICS. Amy did talk about the color wheel but did not dwell on it. Basically, she referred to what we learned about color in elementary school. By doing that, I think Amy made color less scary. Some of the points that Amy discussed in her lecture. Color produces a visceral response in the viewer. Color reflects moods and feelings. Warmth… Comfort…. When making a quilt is important to remember the feelings you want to convey. Amy showed a series of color pallets in a power point presentation and asked us what feelings they conveyed. Avoid using CLEAR / PURE colors with muted, greyed, subdued fabrics. Online class for PHOTOSHOP for sewing enthusiasts. Color by a fabric dyer…. Learn color as you peruse through her wonderful fabrics. This is Jinny’s own method of color evaluation, she does not use a color wheel, but has developed a color pallet. Her approach to color usage is her own method. Color Magic for Quilters …. Advanced / college level coarse. 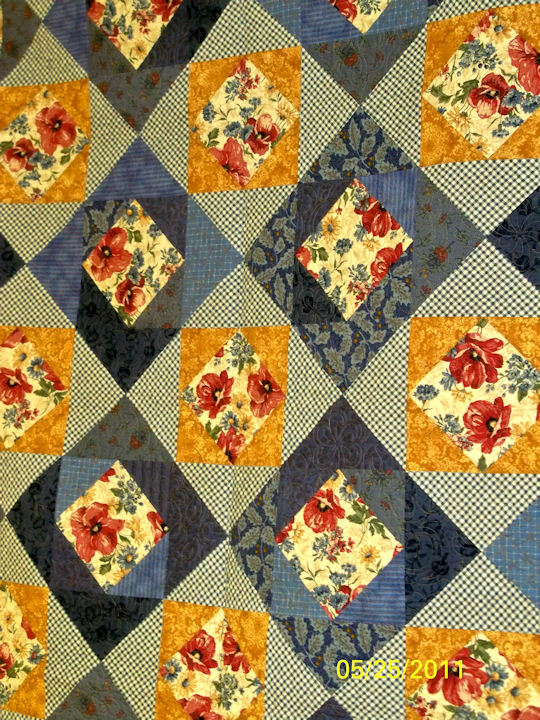 Both traditional and art quilters. Uses photography to explain and illustrate concepts. Art Quilts. WEEKS RINGLE and BILL KERR ……. 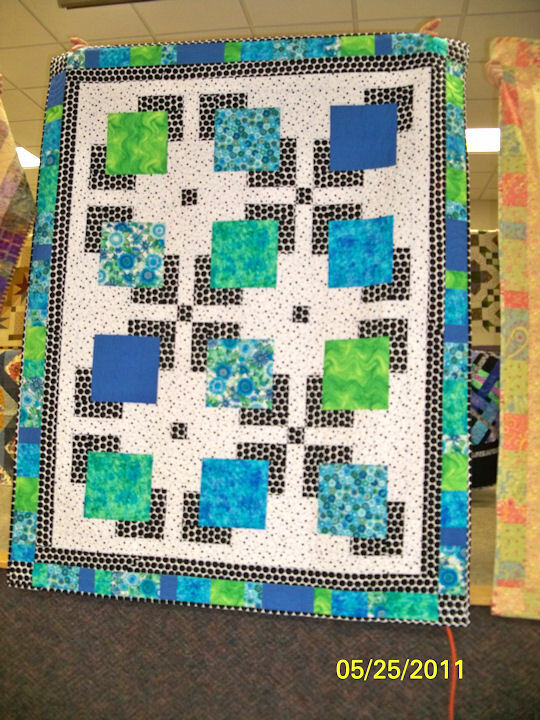 Collage level Contemporary / Modern Quilts illustrating color theory. 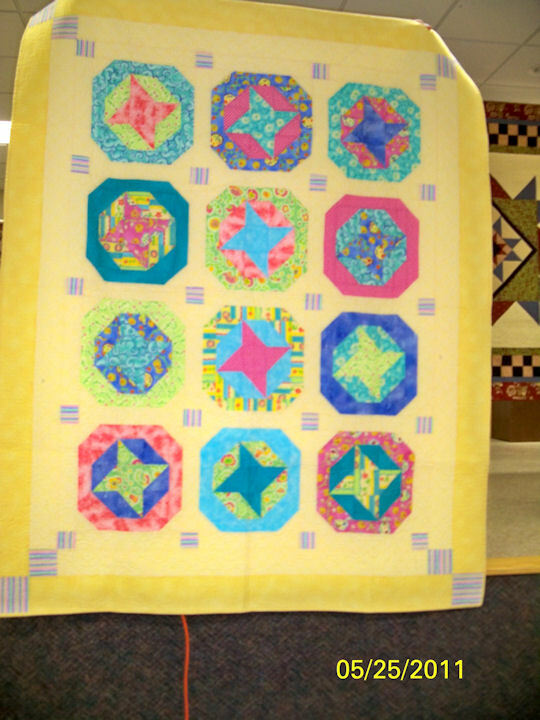 Ann Seely and Joyce Stewart …… Color Magic for Quilters …. I am almost done with this quilt. I just need to finish one more block then assemble the quilt top. We used 6-1/2 inch blocks to make the nine patch blocks. Our fabric was a collection of everyone’s stash raid combine with donated fabric from various sources. 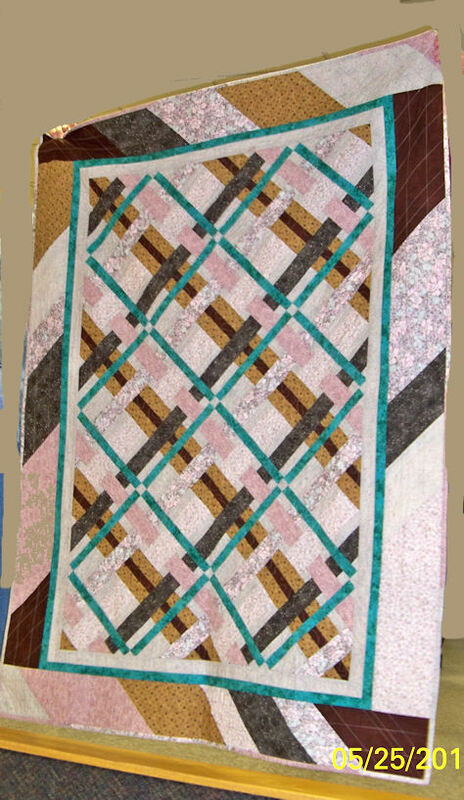 I tried to use as much as I could of several fabrics in the same colors to provide some cohesiveness to the quilt top. I also tried to place the blocks in a light and dark pattern. 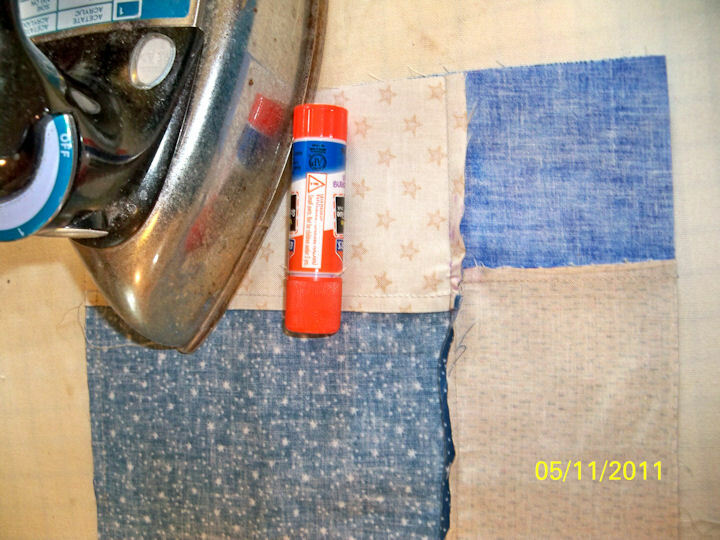 Washable Glue Stick and iron --- Just glue the seam and press. Small dots of washable glue in the seam then let dry or press in place. I do not know why but, I have been having the darnedest time with my seam allowance. Try as hard as I cannot get my seams to lay down flat. I have been pinning but they keep flipping. So I went back to a trick I learned from Sharon Schamber’s YOU TUBE and web site free classes. She used washable glue to keep her binding in place. She also showed using glue in other circumstance / techniques, such as applique. I have used glue in the past and found it to work well. I have used both liquid glue and glue sticks. In my picture I have a thick stream of glue in the seam. I did this just so it can be seen. I usually use small drops then iron the seam in place. This works well to anchor the seams into place. The glue washes out in the first wash. I only use products / glue when I am having a difficult time keeping the seams flat and in place after repeated pressing. I do not use the glue as a routine method. 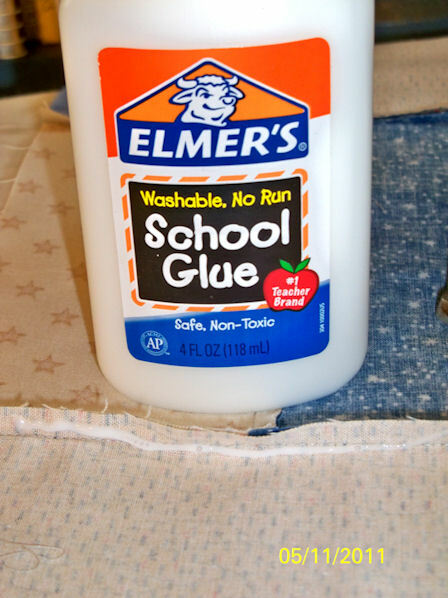 Special tips that fit and ELMER’S GLUE bottles can be purchased at Michael’s and sometimes JoAnn’s. I have also used Roxanne’s glue but find it to be much more expensive. If cheap works, why not use it. OFF TOPIC, BUT A GREAT TIP….. I frequently use CRAYOLA WASHABLE MARKERS to mark my quilting lines. I am not afraid of getting my quilt wet since I soak my quilt and then block it before squaring up the quilt and putting on the binding. Of course, you should test these products out before you use them on your MASTER PIECE QUILT. 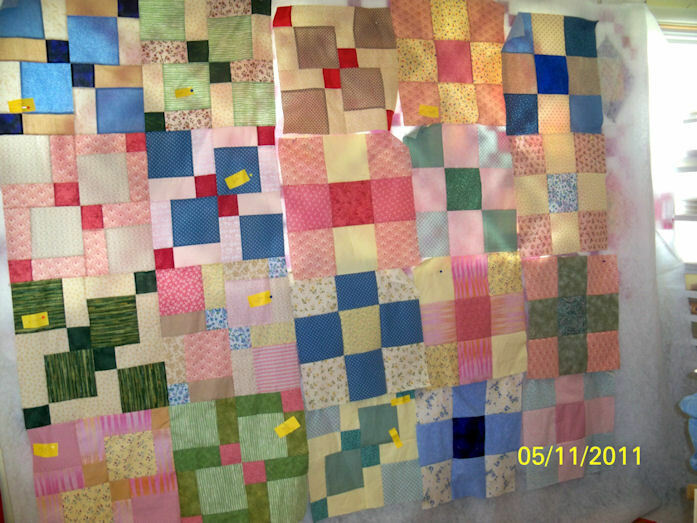 More pictures of the ongoing charity quilting will be posted as I complete the projects. I also hope to take pictures of the projects made by the other ladies in the group. This is a quilt top I designed (yeah?) similar to the comforter tops my mom use to make back in the 60s and 70s, when she worked as a draper in the workshop of an interior designer. She made custom draperies and she often made comforters ( NOT QUILTS) that matched the draperies. She assemble the comforters and then one of the other workers would finish it off. 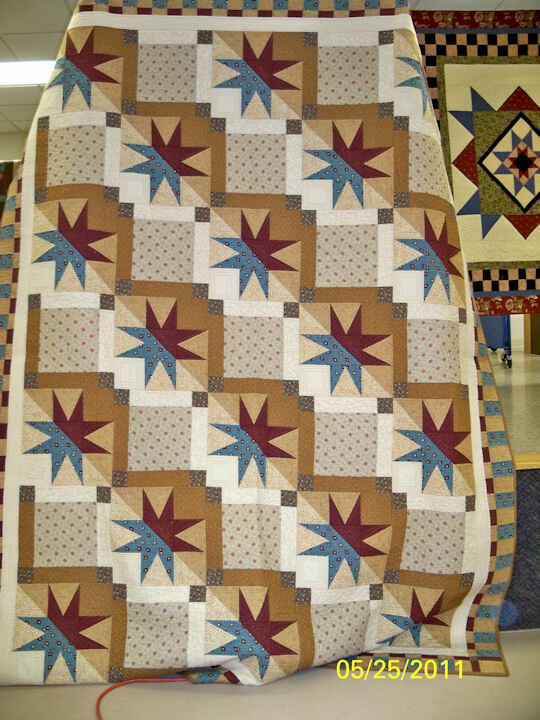 Since we have so many quilts to make and get quilted in such a short time I have been looking for easy quilts to make. To me it is taking advantage of the fabric. 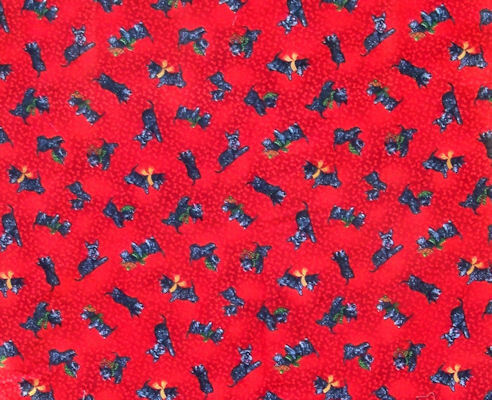 YOU get a really cute fabric x 2-1/2 yards to make the center pattern. I made a small border to frame the FOCUS FABRIC. Because the focus fabric and the border was so close in value I used a gold flange to add a little detail. 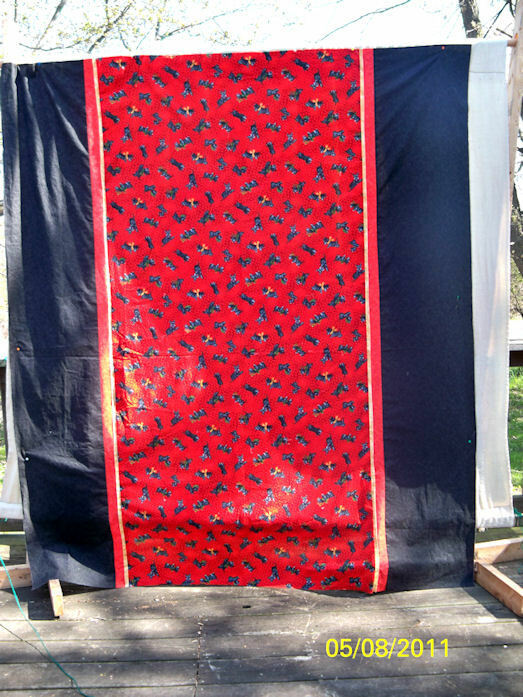 I then took a second larger border ( 2-1/2 yards) from a contrasting but coordinated color. I cut off the binding first thing ( 6 inches along both selvages) I then divided the remaining fabric in half and sewed on the small border details. I then sewed each panel to the side of my focus fabric. I will be dropping off the remainder of the fabric to the quilter at our Wednesday meeting. I am hoping we have more cute yardage to be able to make more quick quilts. The quilting will make this little quilt. Let me know what you think. Please leave comments.